I was one in the forefront who helped Buhari win by investing my heart and pocket – pennies not billions like Saraki – in getting rid of clueless Joe. But before the PDP rats reading this jump at me for ushering in the more of nothing-but-terror-and-denigration that the Buhari regime has been, let me remind you that Atiku did even more to get Buhari elected and expel "your" Jonathan than I did. The irony of it. Atiku was rewarded generously for his investment in Buhari's victory. His guys and girls were appointed into ministerial positions and even became the spokespersons for his brother Buhari. He was Buhari's ambassador during the beginning of the tenure, sent places on federal budgets, till the time came for him to begin his campaign to receive power from Buhari as agreed. Buhari and Atiku are brothers. They think alike, have the same cabal of friends and have the same vision for Nigeria: a primitive nation on clutches where the rich get richer and the poor have two choices– suffer or die. And they employ the same methods: limitless impunity for the cabal to loot freely without consequence and the employment of terror on the masses to intimidate and suppress them, utilizing the army and militant civilians alternately in dispatching terror and instigating ethnic divisions and distractions. Buhari even succeeded in dividing importing the Saudi-Iran proxy war and the north into Sunni-Shia to perpetrate the divide and rule technique he inherited from the colonialists. Chai! Atiku and Obasanjo are remembered for the Odi massacre which claimed as many as 2500 innocent lives in Bayelsa. His brother Buhari is remembered for the Zaria, Onitsha and other massacres that have claimed as many lives. In all cases the dead are secretly mass buried in Khashoggi Saudi style. Only in Nigeria do we have such mass murderers at the helm of government or aspiring to be there again. Only in Nigeria! But worse than killing is persecution, the Muslim Quran says in chapter 2 verse 191. "Justice!" "Justice!" "Justice!" Late Maitama warned to Buhari's deaf ears. The use of state enforcement to perpetrate genocidal acts of terror on the masses is not the only way this brotherly duo are identical. I am on record for promising as early as the first months of Buhari's tenure began, that Buhari will never imprison Dasuki. Can you beat that? Buhari systematically through the SSS fails to bring Dasuki to court to ensure the chief looter of Jonathan's time stays happily at home, with a trial set to never accomplish the goal of sentencing Dasuki. Buhari has failed in four years to sentence a single cabal who looted during Jonathan's time. What a waste of Nigeria's years. And Atiku will be no better.. PDP and APC has made waste of Nigeria's judicial system and use the EFCC only to hound their political opponents. 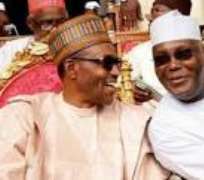 Only a joker will expect any cabal to be sentenced and rot in jail if these two continue to hold the reins of power come 2019. The poor will continue to be locked up for stealing gari while the rich thieves continue to enjoy limitless impunity. The wealthy thieves protected by 80% of our police force as PDP set it up to be and APC maintains it. While we masses die un-policed, our entire police force has been deployed as private body guards for the wealthy looter cabal. And the brutal army is employed in their stead to kill the masses and anguishing youth at will. You see PDP and APC have not only looted all our commonwealth but also our police. Only in Nigeria do we see the army who do not have handcuffs and arrest by killing, becoming police. But while PDPAPC kill us, the cabal are protected and even rewarded for stealing. Babachir Lawal. Abba Kyari. Baru. Godwin Emefiele. Ayodele Oke and wife. Fashola. Buratai, Malami. Are just a few in the list of too big to be punished cabal. We all openly witnessed the shaming of Babachir the grass cutter who STEALS FROM IDPs! Victims of terror! (Yeah, like NEMA, and whoever it was that stole dates donated for IDPs by Saudi! Shame!) What came out of it? We witnesses the Abba Kyari MTN half a billion dollar bribe scandal. Buhari hugged him closer. What of Baru's indictment by Kachikwu and how we have found out that the NNPC channel for looting billions of dollars a year that Diezani used has only been expanded under Buhari's regime? Nada. We all witness the FOREX subsidy scam, with the CBN directly funneling billions of our dollars every year to the cabal. Buhari praises Jonathan's Godwin. Ikoyi millions, anyone? Ayodele and wife roam free. Fashola's half a million dollar boreholes and new scandals under the ministry of power are washed clean. Buratai's Dubai properties and his and minister of interior, Dambazzau's reported indictment in the Army probe report? Echoes in the silent room. Malami? Oh ho ho! And Atiku? LOL. Laugh out Loud. There are too many reports to mention including his reported take over of late Shehu Yar'Adua's stealing and killing empire (Not the good Yar'Adua–Umar Musa) and his reported diversion of PTDF funds to his pocket. He is globally notorious with the US using him as a study guide on international stealing and laundering. Is this the man to lock up those who have plundered Nigeria dry and left our old, young and vulnerable to die for lack. Left us without potable water and even sub-average healthcare in 2018? It is a shame that some desperate stockholmed Nigerians are still campaigning for this duo and not rallying to salvage Nigeria. Two birds of the same feather. Sides of the same cabal coin. Old men with no dignity. Hell bent on stealing the not too young revolution and ensuring they keep themselves in power so the thieves and killers of the past can stay wealthy, healthy and safe from the inside of prison and the Nigerian masses can remain beggars, the most shameful, naturally wealthy-yet-poor nation in the world; only a leader in the worst indices on earth: most terrorized, worst health care, most poor in the world, and so on. Tufiaka! I will vote a new generation candidate or not vote at all 'cuz unlike Obasanjo, I am afraid of God and have pity for the dead and dying.